Seat Sponsorship allows you to commemorate a friend or family member, an organization, special occasion, your business, or to leave your personal mark on our historic theatre. Seat Sponsorship contributions may be made at $1,500, $1,000 or $750 levels. Your Seat Sponsorship supports the continued preservation of this historic cultural institution. Seat Sponsorship contributions are tax deductible, and proceeds in excess of seat cost and installation will help with other capital improvements. The seating chart below shows the location of sponsorship levels and available seats. A naming plate with the message, name, or logo of your choice will be placed on the top of the seat back cushion as special recognition for your gift. If you’d like to sponsor a seat, please contact us. Download our Seat Sponsorship Guide (PDF). Last updated December 10, 2018. Please contact our office to confirm seat availability. Click the seating charts below to enlarge. (Or download the seating charts as a PDF.) 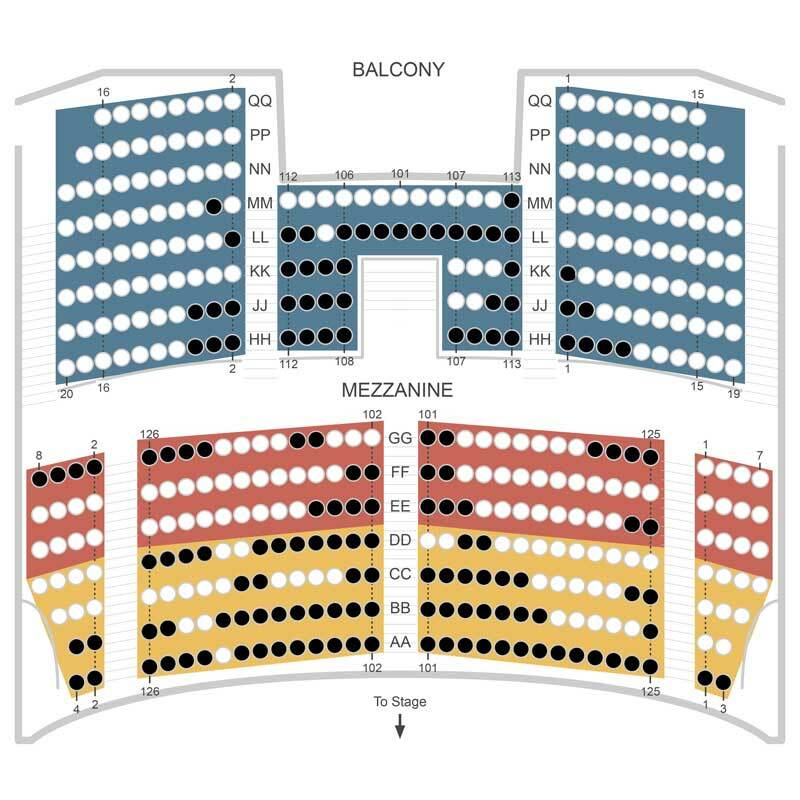 Seats marked in white are available for sponsorship. Seats marked in black have been claimed for sponsorship. Individual seats may be sponsored for $1,500 each in gold locations, $1,000 each in red locations, and $750 each in blue locations, as indicated on the maps below. Donors may specify the seats they wish to sponsor on a first-come, first-served basis. The nameplates will accommodate up to 50 characters. The seating diagram indicates sponsorship levels by color. Gifts can be made by check or credit card. Seat sponsorship is not a reservation of the seat itself for future events. Season tickets are purchased separately.Whenever possible, seat sponsors will be given a first right to reserve tickets for the seat they have selected. Seat sponsorship is a naming opportunity for capital expenditures and is not a reservation of the seat itself for programming. Whenever possible, however, seat sponsors will be given a first right to reserve tickets for the seat they have selected. 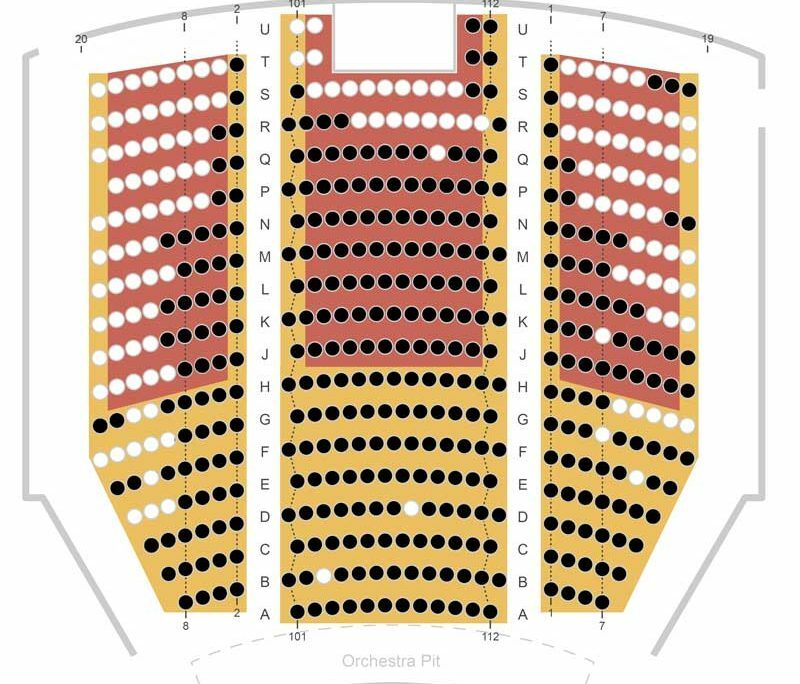 Specific seats are available on a first-come, first-served basis, but the HCHTA reserves the right to change seat sponsorship location (within the same sponsorship level) due to construction changes or seating reconfiguration. Nameplates will become part of the rich history of Peoples Bank Theatre. As a seat sponsor, you have first opportunity to purchase subscriptions to our Spotlight Series events and specific series tickets in advance of general public sales. Seat sponsors will be given a limited pre-sale time–typically one to two weeks—to make ticket purchases for their sponsored seats. After the specified pre-sale, sales will be open to the general public. Once sales open to the general public, seat sponsors may also purchase additional tickets beyond those available for their specific, sponsored seats. There are times when an outside promoter or rental party wants complete control of the theatre. In these cases, we cannot guarantee seat sponsor pre-sale. Shows may be booked after the announcement of the Spotlight Series or other event series. Whenever possible, seat sponsor pre-sale will be made available. However, in some instances, the timing of the booking or terms of the artist’s contract may preclude the theatre from offering such pre-sale opportunities. General admission and cabaret events are also unavailable for seat sponsor pre-sale, due to the nature of ticketing and seating for such events. For Spotlight Series events—and other events when seat sponsors pre-sale is made available—the theatre will send notification by email and mail approximately one-to-two weeks prior to general public sales. These communications will specify the events available for pre-sale and the seat sponsor response deadline, after which sales will be open to the general public. It is the responsibility of the seat sponsor to exercise their ticket purchase privileges within the pre-sale period and to ensure that the theatre has up-to-date contact information for these communications. Once the pre-sale period ends, any and all unsold tickets for sponsored seats are released for sale to the general public.